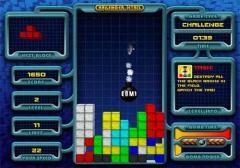 SSuite Tetris 2D is a free and portable game designed after the classic Tetris game. It consists of falling geometric shapes, each made of four square blocks that fall down. You will need to move and rotate the shapes by 90 degree units to create rows of ten blocks without gaps. Each time you create such a line, it will be cleared from the playing field. Once you clear a certain number of lines, you will advance to the next level. Higher levels will also increase in difficulty, as the shapes will fall down faster. The game ends when the stack of shapes gets to the top of the play field. SSuite Tetris 2D provides 13 challenging levels and you can choose the level before starting the game.